Gordonia Alatamaha State park is a favorite for picnicking, family reunions and golf. Picnic tables and shelters surround a small lake where visitors can rent pedal boats and fishing boats during warmer months. Docks are available for anglers, and children will enjoy looking for beaver dams from the observation deck. Five rental cottages face the golf course, all with screened porches, fireplaces and televisions. The park is on Highway 280 West, inside the city limits of Reidsville, and when visitors call to ask for directions, park employees tell them "we're just past the Dairy Queen." Gordonia-Alatamaha’s unusual name comes from the rare Gordonia tree and the original spelling of the nearby Altamaha River. The Gordonia alatamaha tree, better known today as Franklinia, is a member of the Camellia family that once grew in the Coastal Plain of Georgia. It is shrouded in mystery as it was discovered by the famous botanist explorer William Bartram and was last documented in the wild in 1803. The park’s Brazell’s Creek Golf Course offers a pro shop and junior/senior discounts. The 18-holecourse is a challenging yet fun test of golf. The Par 71 layout plays to just under 7,000 yards from the tips, boasting five sets of tees. The signature 15th hole is a 207-yard Par 3, which plays over scenic wetlands to a large island green. A 1,500-yard winding bridge connects the original holes with the back nine. The Park is completely surrounded by houses, but as you drive into the tree-lined entrance you forget you are in a inhabited city. The entrance road opens up into a beautiful state park. The first thing you see is a large playground area for all the children to enjoy. 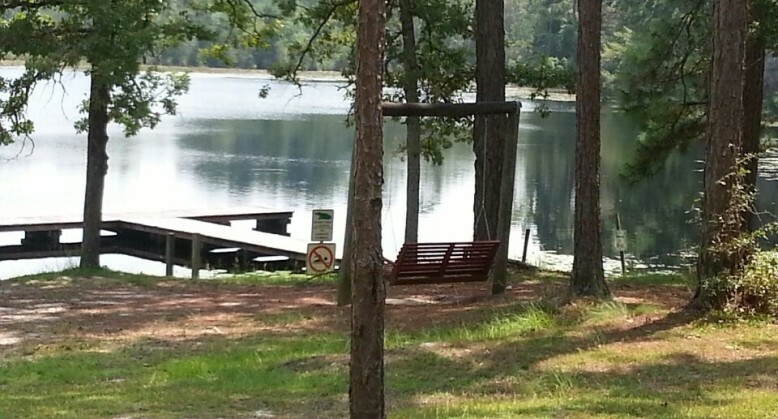 There is a basketball goal and a volleyball net, miniature golf, a swimming pool, four open picnic shelters, one enclosed picnic shelter (with AC and heat), many picnic tables for everyone's use, and a 12-acre lake with fishing and paddle boats. The park features 29 campsites for RVs and tents; all have water, electricity, picnic table and a grill. Five have sewage hookups and the park has a dump station. There is a bath house in the center of the campground with restrooms, showers, washer and dryer units and a small playground. Most of the facilities are handicap accessible. At the far end of the park, just past the camping area, is Brazell's Creek Golf Course. There is a $5 entrance fee for a day pass to the Park, and maps and guides are available free in the Park's Welcome Station. There is a park gift shop and income from the shop supports the park. Fishing – boat rental - private boats permitted, electric motors only. Camping and Golf Packages are now available at the park's 18-hole Brazell's Creek Golf Course. Call 1-800-434-0982 or click here for more information. Center for Wildlife Education in Statesboro, Ga.